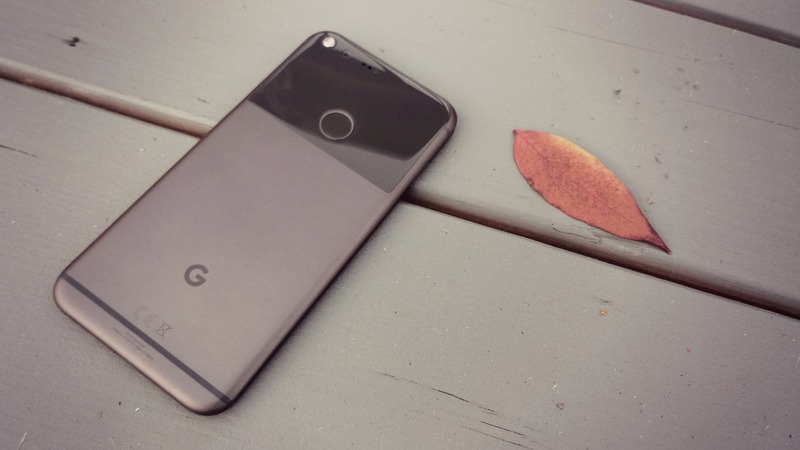 Announced at a San Francisco event on October 4th, the Pixel and Pixel XL are the two new smartphones from Google for 2016. The pair of phones are the first to offer the Google Assistant software technology and look to head further down the path already started by the nexus line. What makes this year’s effort different from those in the past? As it turns out, plenty. Not only is the Pixel line smarter and more capable than all other phones, but it also packs a world-class camera experience, too. 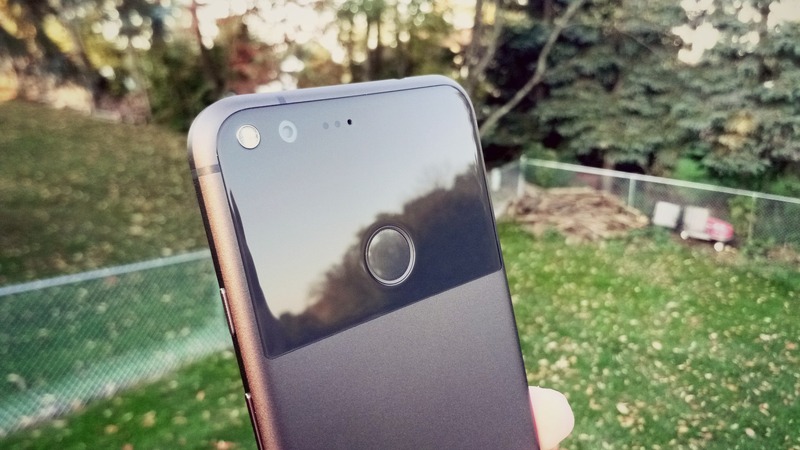 Indeed, the Pixel offers up a rear camera that bests all previous smartphone shooters. 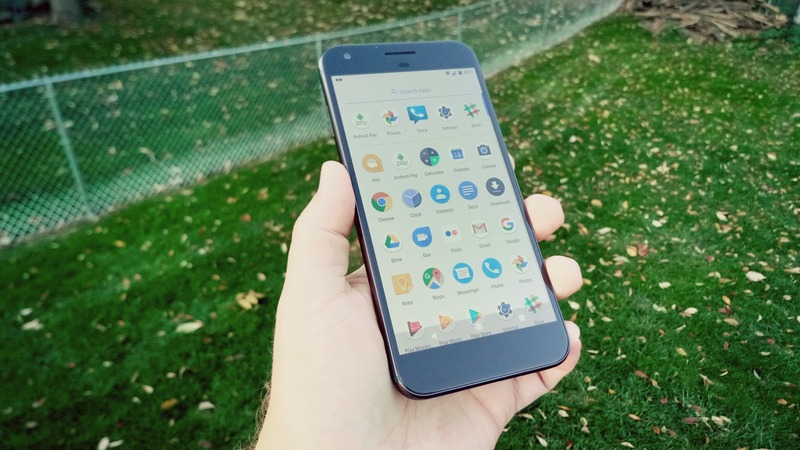 Digging into the hardware, the Pixel boasts a Qualcomm Snapdragon 821 processor, among the first smartphones to do so. Clocking in at 2.15GHz (four cores) and 1.6GHz (four cores), the handset also benefits from having an Adreno 530 GPU. Toss in 4GB of memory and you’ve got the making of one of the most well-rounded phones of all time. Storage comes in the form of 32GB and 128GB options but you won’t find a microSD expansion card slot. This might push some away as some of us have come to rely on external storage for housing our media. But, before you get out the pitchforks, know that the Pixel and Pixel XL give customers unlimited lifetime storage of photos and videos at full, original resolution. Yes, that also means the 1080p and 4K videos you’re starting to see emerge. Available in three distinct colors, the Pixel line can be had in Very Silver, Quite Black, and Really Blue. Prices start at $650 for the Pixel and $770 for the Pixel XL with availability through a number of online retailers. At start, Verizon Wireless will be the exclusive service provider to offer the phone. Don’t let that scare you off, though, as the unlocked models will work with other carriers, too. What’s the difference between the Pixel and Pixel XL? In short, it’s a larger display; 5.5-inches at 2560 x 1440 pixels instead of 5.0-inches at 1920 x 1080 pixels, and a bigger battery. The Pixel packs a 2,770mAh power source while the Pixel XL gets a 3450mAh unit. We’ve spent the last few days with the Pixel XL and are ready to offer up some initial impressions. While we wish this was a full-on review, there’s simply no way to get that much feel for a device after only four days, two of which span a weekend. The phone takes a very minimalistic approach which starts at the box itself. With very little printed on the outside of the box, it feels somewhat like how Apple might package the device. Gone are the days of flashy boxes with all sorts of specifications and photos; this one is as bare bones as it gets. Sliding the box out of its shell and opening it up we are greeted with the phone on the left and power supply and cable on the right. Underneath we find the additional cable and an OTG USB adapter for transferring files from another device It’s worth noting that we did not receive any headphones with this device so we cannot attest to whether this is the norm. Our box did not have any Verizon branding on it but we did receive a Verizon sim card to use for testing purposes. 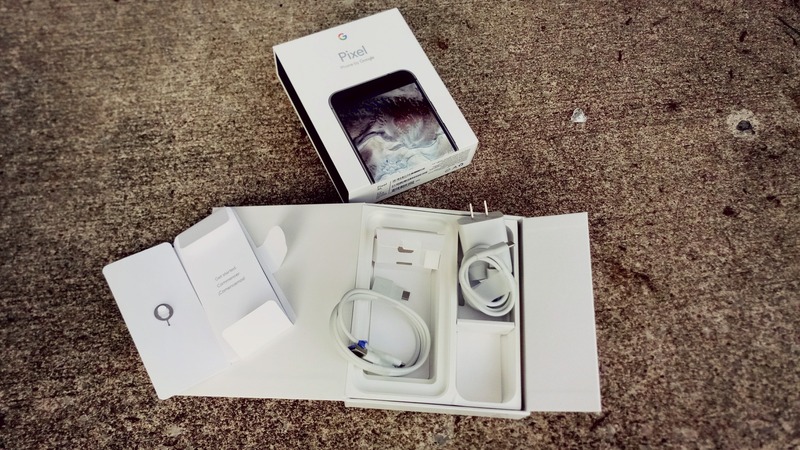 There was no extra space for headphones; they are not listed as included in the box on Google’s website. Looking the phone over it definitely has a quiet and simplistic design. It is altogether very basic and boring yet still a little bit refined and unique. The bottom black is more than pictures suggest and the top is a little shinier in person. Both materials, however, are soft and slippery to the touch. I’ll be honest, I would prefer the Silver version over the Back or Blue. In my time with the demos at Google’s press event, I found it to be in line with my preferred style and generally more stylish. 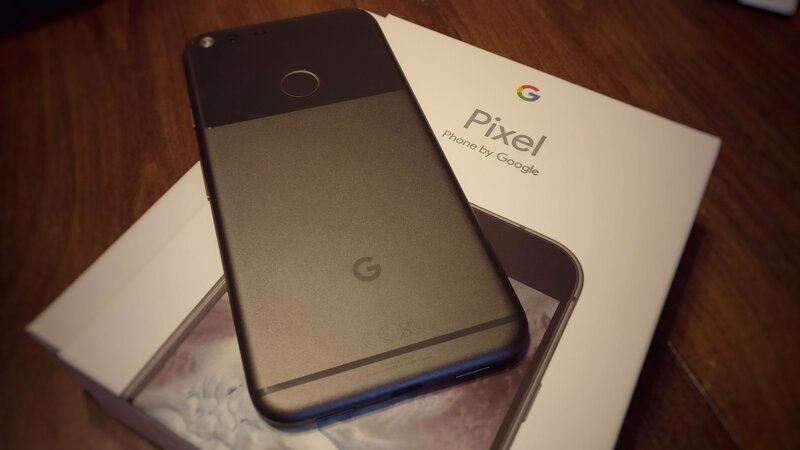 But, given that I will ultimately protect this black one with one of Google’s Live Cases at some point, that color becomes a non-issue. At a distance of a few feet, the black Pixel XL looks like a very utilitarian an almost uninspired slab phone. Pick it up, though, and you can feel the design choices in the material. The glass feels strong and secure and not prone to pick up fingerprints. The back, smooth and premium, also comes across as well-intentioned and thought out. But, were it not for the shiny upper third, the phone might be construed as generally boring – in black at least. Again, the Silver and Blue models felt “new” where this color is just “meh”. The power button is located to the right of the display with the volume rocker sitting almost halfway up on the same side. 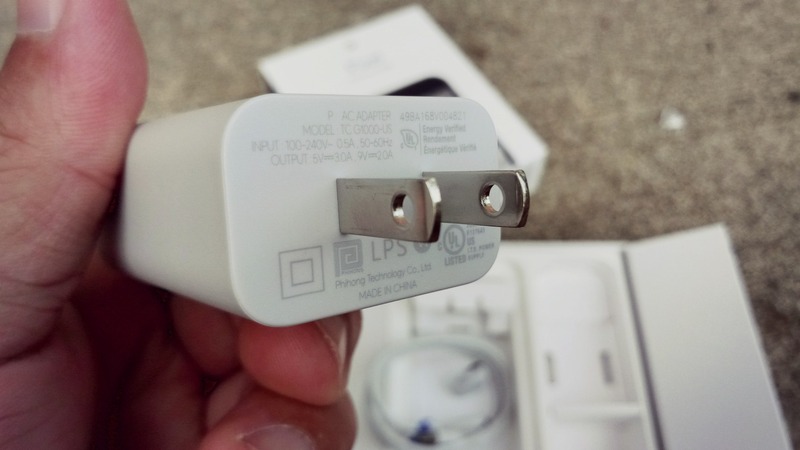 Up top we find the 3.5mm headphone jack while below the screen is the USB Type-C port and speakers. Well… one speaker; more on that below. Whereas the screen does have a slight bezel to both the left and right of the display there is a much more pronounced one above and below the screen. I am not certain as to why there is so much going on below the screen as there are no soft buttons or physical buttons to be found. To be sure, it does feel like a lot of wasted space. My gut tells me it has something to do with having a uniform or mirror approach where the top reflects the bottom. Staying with the topic of the display, the ever-so-subtly curved edge around the screen is quite nice. And, when you factor in the Gorilla Glass 4 and protective, oleophobic coating that keeps it from getting smudges and fingerprints, we can surmise that this display will take a decent beating and still look sharp in the process. As far as the picture quality goes, the 2560 x 1440 pixels image is sharp and vibrant. We’d expect nothing less in a flagship phone with a 5.5-inch screen, especially in late 2016. Given that, it’s easy on the eyes with a well-balanced color. Around back we locate the fingerprint reader which is about one-third of the way down from the top. It is essentially in the same spot as the Nexus 6P and feels very natural when reaching for it. Above and to the left of the fingerprint reader is the rear camera and its flash and Phase Detection Autofocus (PDAF) and Laser Detection Autofocus (LDAF). Then, of course, comes the branding of the device. 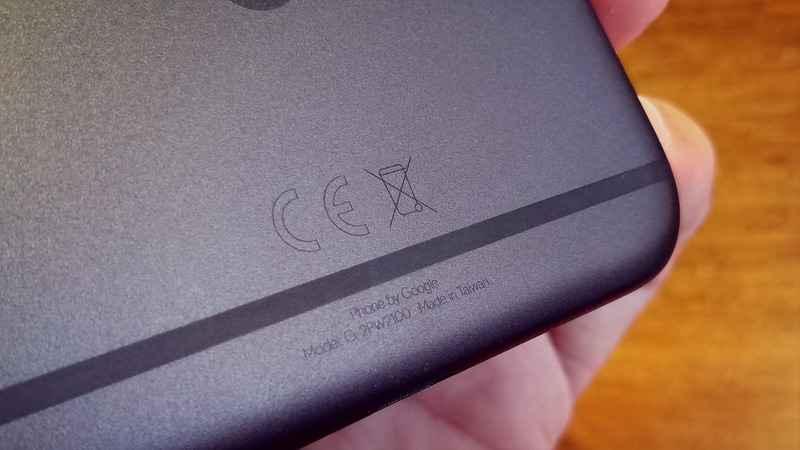 Gone is the “Nexus” that emblazoned the flagship line of phones. Also gone is any mention of the word “Google”, too. 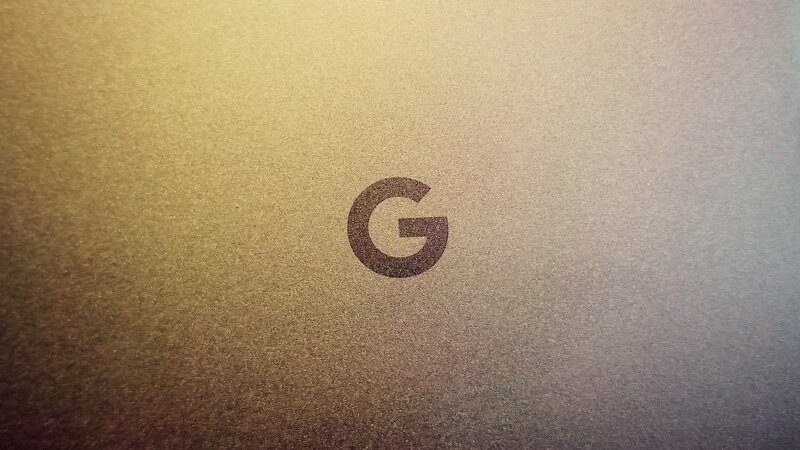 In fact, the only thing you’ll find now is the stylized G which represents the brand itself. If you squint, the bottom displays a “phone by Google”, but it’s not outwardly obvious. Powering on the device we are greeted with a very stripped down approach to Android. Nothing that is startling, mind you but it is quite refreshing to go back to a stock Android experience that is only what Google wants you to have. You won’t find any bloatware of carrier-branded software or services. This is as raw as it gets, and you’d be silly not to want for it. To us, there’s nothing quite like the default vanilla Android builds. 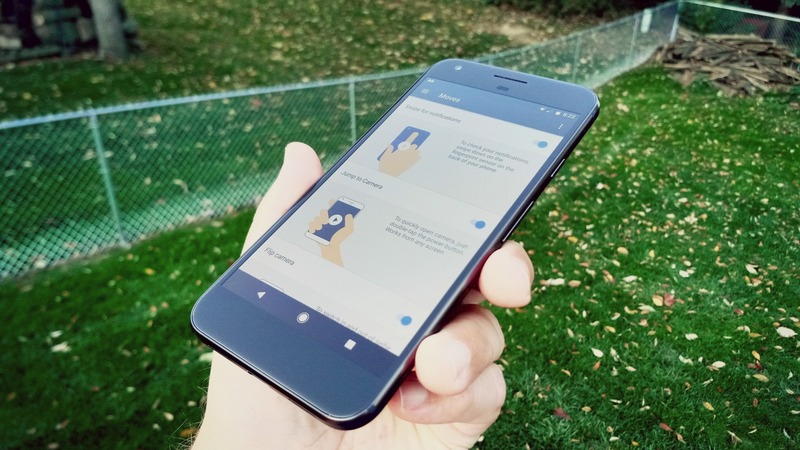 We’ve reviewed plenty of Android phones over the years and one common thread that skews scores more favorably is how the Android OS works. Google’s vision of Android is something we’ve always come to love. The stuff we’ve seen in this version of Nougat is no different. Hell, it’s better than ever. The Android 7.1 build is very easy to learn navigate. Having tested every version of Android so far this one feels the most intuitive and user-friendly. The round icons are nice and uniform for the most part, however there are a few that stick out such as Allo and Keep. And, once you start to install other applications, that cute uniform user interface doesn’t look so uniform. A few weeks from now, when we have a bunch our daily driver apps, the app tray won’t look as pretty. Call us silly, but this is where a custom launcher and icon pack can make all the difference in the world. Going through the initial setup is a breeze, and Google does an excellent job of walking customers through the process. If you are migrating from one platform to another, Google will hold your hand as you make the jump from iOS to Android. Not only is the software there to support you, but there are cables in the box to assist as well. If you already have an Android device, this setup makes it easy to get your phone back up to where you want in no time at all. And, if you are brand new to smartphones altogether, the Pixel and Android 7.1 are smart, intuitive, and comprehensible. The best part? You’re getting into an ecosystem (Google) of which you are likely already familiar and not one put forth by a wireless provider with an agenda. 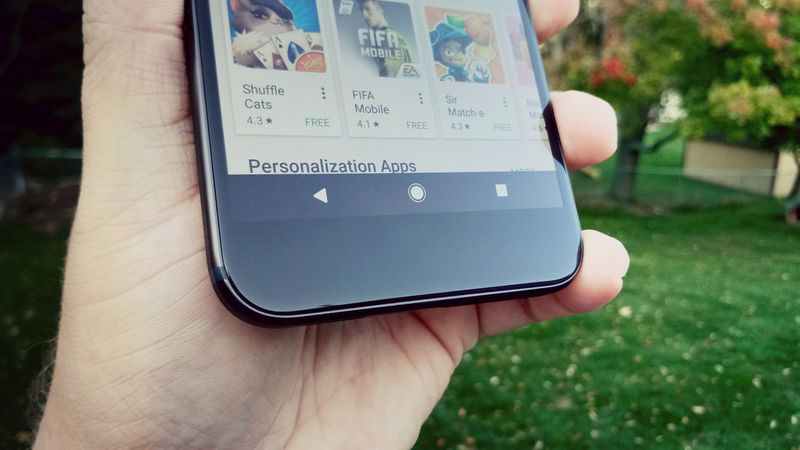 Carried over from previous versions of Android, the launcher brings up all of your relevant news and information with a simple swipe to the left panel. As somebody who is quite fond of Nova Launcher and custom launchers, I am actually not in a hurry to get rid of the default Google setup. There is something very appealing about the way Google designed the interface. With that said, I like the way in which users can swipe up from the bottom row of the phone to access the app drawer. No longer are you required to tap a specific icon; this is refreshing and comes across as “why didn’t they do this all along?”. The general color scheme, icons, and other Material Design cues work better than ever and come across as cohesive. We’ll be honest, it takes a little bit of time to understand what Google Assistant can really do for you. It is much smarter than a simple Google search or using Google Now. While you might be familiar with asking very specific and explicitly defined questions in the past, the Assistant is much smarter and more forgiving. We like that we can use this from anywhere on the device and get help on just about anything. We even relied on it to help us find certain settings in the software on our phone. If there’s one are we’ve slowly eased yourself into with Google Assistant, it’s being able to talk more normally. Look up Red Lobster, for instance, and then you can follow with, “how late is it open?” instead of, “how late is Red Lobster open?” Moreover, follow that with, “navigate me there” and you’re handed off to Google Maps. Playing around with the settings, we found the “moves” and gestures to be rather helpful. Users can toggle one of three settings to make the overall experience quicker or more intuitive. One will let you double tap the power button to quick to launch into the camera while the other one lets you flip your wrist to go from rear-facing to front facing camera. It is not unlike what Motorola does to launch into its camera application. The one we like the most, however, is this swipe for notifications. Users can swipe their finger down the rear fingerprint scanner to slide the notification shade down. Slide up, and they go away. It is very simple to unlock your phone and check for all notifications with just one finger. In terms of battery, we think this one is a real winner. The standby time and talk time have been spectacular in these first four days, and we’ve only had to charge the phone twice. This includes using the charge that came out of the box which was roughly ⅔ full. Plug the Pixel XL into the wall four a half hour and you’ll find you are back up and running with damn near a full day’s worth of juice again. Google claims 15 minutes of charging equates to seven hours of mixed use battery life. While it might appear that the bottom of the phone houses stereo speakers, it’s really a case of one speaker and a placeholder cutout to match it. Indeed, the one on the right side is a dummy that doesn’t put out any sound. With that said, the lone speaker does provide a rather loud experience that’s clear and full. Watching a video in portrait will put the sound out in your right hand and, depending on how you hold it, could be muted by your palm. Let’s talk about that camera, eh? We’re not experts in the area of photography, but we were seriously blown away by what the Pixel XL delivers. It’s super fast and color accuracy is as good as anything we’ve ever seen in a phone. And Google wasn’t lying when it said that HDR was enabled by default. Was the camera perfect? No, we still had blurred images, for instance, when trying to capture a moving dog in lower lighting conditions. Moreover, there were traces of noise in night shots, too. But, when zoomed out and stacked up against other phones, the Pixel has already become a favorite still shooter around here. You can take a look at the embedded images below to get a feel for how the camera performs on the Pixel XL. We’ve only loaded a few of the daily driver applications on this device so we can’t speak to the long-term viability, but we are quite optimistic. Things move about very quickly in all aspects of this device. The screen responds to our touch quickly, the apps load instantly, and Google Assistant never wastes time and getting you the right answers. The same goes for the camera shutter and fingerprint scanner. All things considered, we’re very pleased with the Pixel XL thus far. There’s nothing here that alarms us, but it’s still not a perfect device. We’ll always champion for external storage and a waterproof coating is one of those features which should be standard by now. But, a few quibbles aside, it’s one slick piece of kit. When you look at how much phone you can get for $400 today, it begs the question of whether the Pixel or Pixel XL are worth the extra money. To us, that comes down to a personal use case. Do you want or expect to take a lot of photos or video? If so, the Google line is one to keep an eye on. With unlimited cloud-based storage, you’d easily spend money on another service for that kind of hosting. Ask a photographer or media creator how much they’d like to have 4K video service that houses things for them. 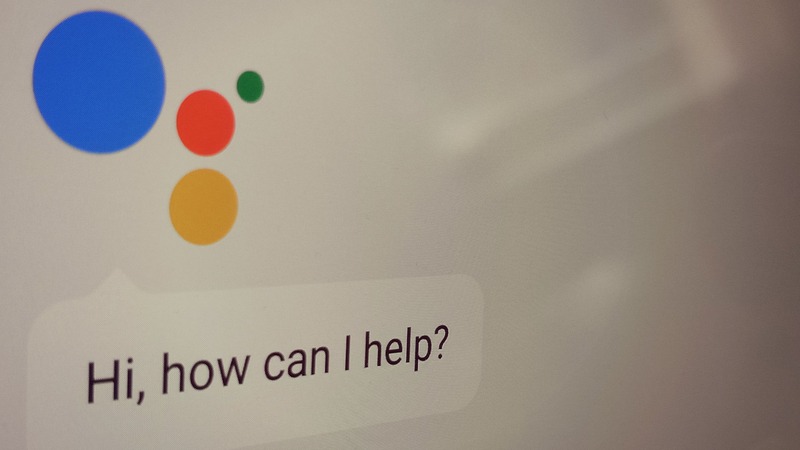 How important is it to you to have the Google Assistant? What about the latest release of stock Android? The 7.1 Nougat definitely has its advantages in both departments. First time smartphone buyers might not necessarily head for the best of the best when it comes to devices. But, should they want to dive in head first, the Google Pixel and Pixel XL are worthy contenders. This goes double if you need a helping hand; the built-in 24×7 support is something you won’t get elsewhere. We’ll spend another few weeks with the phone and circle back to provide you with our full review.